Before we get into my own made up burger competition, let's talk. #1 I have no friends. Isn't this a recurring theme from when I first left Canada and complained about not knowing anyone? Not much is different. I'm not overly worried though. #2 Job prospects are bleak. Applied to about 6-8 ski hills jobs, only heard back from one so far but it is in the North Island and is expensive to get there. I also want to live in the South so just waiting to hear back. If not, plan B will need to be made/implemented. #3 Everyday people go skydiving and bungee jumping and other fun activities. People come back and talk about there day and ask me what I've been up to. Well, I slept in till 12, read a chapter in my book and now I'm watching the Star Wars trilogy. This is the type of adventure you were expecting to read about right? Miss Thailand, my girlfriend at that time, Canada and my family. Nothing serious just miss people. Things will get better once I get a job, a place and a bit of a routine. Competition time! 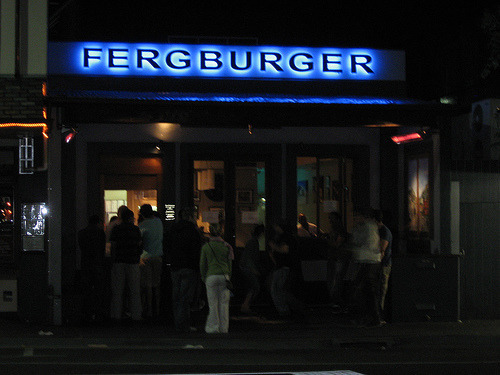 Fergburger is a Queenstown staple. Everyone raves about it, it is one of the 'must-dos' while here. I'm not against eating massive hamburgers so last night I took the two minute walk in the rain to order my first Fergburger. Not crazy busy inside but had to wait not too long for my $15 double pattie burger. Why get one when you can get two? Having hears tons about this place, uncontrollably my expectations were slightly raised. Which as we all know, is a terrible thing. It wasn't bad, filled me up, a lot of food for sure. But if it wasn't such a big deal, I wouldn't tell anyone they HAD to go here. Out of 16 Burgers, I would give it a 14.75. Apparently open till 5 am which is a plus but wasn't the best burger I've had in New Zealand. There is a letter in the store from a doctor who had to treat an Irish man who had a broken jaw, holding a Fergburger saying that a Big Al was the culprit. NEXT! Meet the Brettburger. Advertised in my hostel as better than Fergburger, the owner of the hostel (can you guess his name?) makes a Sunday dinner every week and different meals on Wednesday's. This happened to be his burger night. $10, didn't have to leave the hostel, just sign up by 12 pm and wait till it is ready. Again, saying his was better than Fergburger raised my expectations a tad. A big burger, fresh meat, great sauce, nothing wrong with this burger. I would give it 15 of out 16 burgers. I had this one the day before I had Fergburger so the comparison was fresh in my mind. This is what occupies my days here, spacing out my hamburger choices. NEXT!! We have a winner folks! The first weekend I got here, I read about a burger place that only opens at 8 pm till late. After a few drinks, I found this place and wasn't disappointed. I think the main difference is having buns that aren't too big and getting the best meat as possible. All three places made them when ordered. This place had the best atmosphere in my opinion as well. Maybe it is just me trying to be different and saying I liked The White Lady more, (I ate there twice) but I really do think this place tops Fergburger. And the chef was Canadian! I would give it 15.4 burgers out of 16. Almost forgot, the other night after going to country bar that has a mechanical bull but no country music, not impressed, I stopped at McDonald's. I might have eaten a Double Quarter Pounder with cheese then ordered 10 McNuggets and ate them at my hostel. I'm becoming quite the fatty. 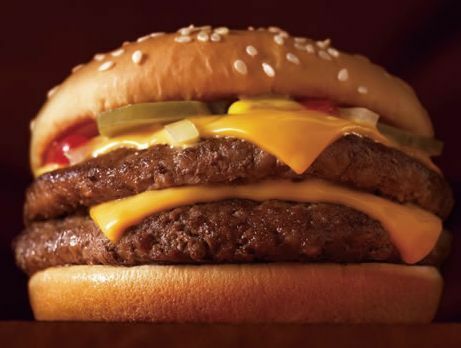 Double Quarter Pounder=15.2 out of 16.